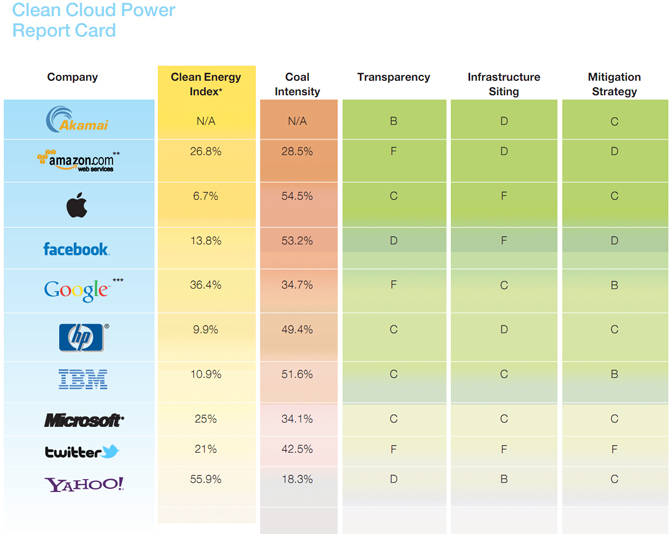 The report entitled “How Dirty is Your Data: A Look at the Energy Choices That Power Cloud Computing” analyzes power consumption and pollution generated by super datacenters operated by Apple, Facebook, IBM and others. Apple, whose latest 500,000 square feet datacenter in North Carolina is either operational or about to flip the switch, ranked last in the report. Most datacenters use “dirty energy”, Greenpeace said. Many companies treat their energy consumption a bit like the Coca-Cola secret formula, because they don’t want competitors knowing how much they spend on energy. Consumers want to know that when they upload a video or change their Facebook status that they are not contributing to global warming or future Fukushimas. Greenpeace said Facebook should “UnFriend Coal”, referring to their first company-built datacenter in Prineville, Oregon which relies heavily on coal-based electricity. Facebook is thought to be building a new $450 million datacenter in Western North Carolina. The state is also the home to Google datacenters. The top five datacenter polluters according to their reliance on coal-based electricity are Apple (54.4 percent), Facebook (53.2 percent), IBM (51.6 percent), Hewlett-Packard (49.4 percent) and Twitter (42.5 percent). Twitter’s new datacenter in the Salt Lake area is also heavily dependent on coal-produced electricity. Interestingly, the organization singled out Amazon, Akamai, Google and Yahoo – all heavy cloud-focused companies – for their use of cleaner energy sources in datacenters. For example, the search monster said yesterday it would commit a $100 million over the course of twenty years to secure hundred megawatts of power from a wind farm in Oklahoma. Apple is rumored to be revolutionizing datacenters the way they innovate their gadgets and they recently hired eBay datacenter executive Olivier Sanche and Microsoft’s datacenter whiz Kevin Timmons.